Time to tackle The Staff "Slake" (1981/2012), the twelfth game in Roger M. Wilcox's recently unearthed text adventure series -- the games have not been converted in chronological order due to the vagaries of aging TRS-80 cassette tape, so this one was written in 1981 and converted to Windows by the author in 2012. As the title suggests, this one takes place in a traditional fantasy setting, with magical creatures, weapons and treasures to find. North is the entrance to an underground stronghold, with steps leading down to a foyer and darkness ahead. We can't muddle our way through -- bad moves mean You fell and broke your neck! You're dead! -- so we need to find a light source. East we discover a secluded and deserted campsite, and what appears to be a makeshift gunpowder factory not subject to OSHA regulations. A mound of white phosphorus and a pile of sulfur lie perilously close to an old lantern which is self-igniting, but couldn't possibly hold liquid fuel. It needs some sort of fuel however, as an attempt to LIGHT LANTERN confirms. South of the starting area is a desert wasteland, and to the west is a dense jungle, so we may need to do some maze mapping here. The wasteland features the skeleton of a prospector, an empty canteen, and a shovel. The prospector has a cracked ribcage -- but we can't TAKE RIB or GET RIB or KICK SKELETON or GET SKELETON. OPEN RIB mysteriously replies, "You don't have a key." 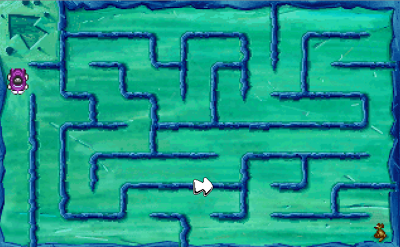 The desert area isn't really a maze -- it's just two rooms, with most directions just returning to the current location. The jungle is similarly minimal, with only one location we can't even seem to DIG in. So where can we dig? Digging in the phosphorus and sulfur at the campsite yields a key and a sign indicating the campsite is the *SCORE* location. Now we have a key, but reality holds -- You can't open a rib. We can BREAK RIB, though, to obtain a dry human rib bone. We can dig in the dark area south of the foyer to find something we can't see yet... but we're informed that the stone is rushing downstream quickly, and shortly thereafter The stone flowed on past you. Is this lava? We can GET SULFUR and GET PHOSPHORUS, but trying to FILL LANTERN correctly suggests that Phosphorus would explode. How do we... ah, MIX SULFUR produces a sulfur-phosphorus mixture, then we can GET MIXTURE and FILL LANTERN. Now we can return to the stronghold to see an uncompleted room with dirt walls (and hear a river trickling by, apparently being in the dark somehow prevented the sound from reaching us earlier.) There's also a locked iron gate denoted as the stronghold's final entry point. We have a key, so we can simply UNLOCK GATE, and it disintegrates, leaving us with a Coated key due to some deteriorata left behind. Digging in the uncompleted room produces a river of wine, and the stone called "Staffbreaker." Now we understand what the rushing and stone business in the dark earlier was about. We can GET STONE before it washes past, and FILL CANTEEN with wine. Entering the stronghold, we find ourselves in a hallway laden with cobwebs, the body of a previous adventurer bearing two large puncture wounds in his back upon closer examination. Giant spider? An out-of-the-way dead-end room features a thin iron door, which the parser informs us "can't be opened by normal means, but it does have a keyhole. Just go through the motions." I tried to INSERT KEY -- which seems to work -- but couldn't then TURN KEY or UNLOCK DOOR or OPEN DOOR. The door reads, "Treasure room. No entry." The key is coated with a black, stinking, pressure-sensitive powder. There's actually nothing to prevent us traveling through the cobweb room -- I had assumed a spider attack was in the offing -- to reach the brink of a pit. There's a nice bit of user-friendly design here -- if we go into the sheer-walled pit when we're improperly equipped to escape, the game gives us one chance to take back that command. We will want to go back later to retrieve the *Jeweled crown* visible during our brief stay down there, though. Past the pit is a "T" intersection with the warning, "Entry to the west is prohibited." Going west, as our investigative honor compels us to do, we face an armored warrior with a magic sword that magically can't magically miss. Game over! Going east instead, we find some leprechauns guarding a * Pot of gold * in a cul-de-sac. We also (in my playthrough) learn that the lantern eventually burns through its fuel, forcing us to return to the campsite for more. There's a bug here (as of 05/18/2013) -- we can INSERT KEY at the thin iron door, but it remains in inventory. We can then drop it elsewhere, and see it there, but when we try to GET KEY again, "It is in the door, sorry." Back at the door, TURN KEY for some reason reports, "You don't see it here." We can't PULL or TOUCH or PRESS or HIT it to any productive end, either. I had to peek at the source code to find the right combination to make progress -- we have to INSERT KEY, then DROP KEY in the same room as the thin iron door, and then TURN KEY. I think the design thinks that inserting the key also suggests that the key is in the room, but the logic isn't quite coded that way. Now a gunpowder explosion (from the coating on the key) blows us back and reveals a passage to the south. In the main treasury/weapons chamber, we find the titular treasure -- * The staff "Slake" *. HELP suggests that we can PARRY and FILL, as a couple of unusual verbs. PARRY versus the magic warrior prompts, With what?, and LANTERN is of no use. But STAFF works much better, causing the magical warrior to magically drop his * Magic sword * and run away in magical fear. West of the guard station is a large stone door, apparently requiring a key, and a "bird house" room featuring a carnivorous goose, eyeing you hungrily -- a gander is appetizing for the goose, it seems. The armored warrior is still hanging around and blocking the entrance, sans his offensive gear, and we can KILL WARRIOR -- With what? -- SWORD to destroy him with his own weapon. 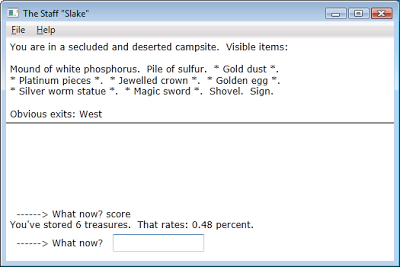 Taking the sword and staff to the campsite, the two treasures yield a .16 percent score, which suggests we have a lot more treasures to capture. Even if it's meant to be read as 16 percent, we have a long way to go. We can't KILL LEPRECHAUNS or KILL GOOSE. We can't GIVE BONE or FEED GOOSE either, but if we DROP BONE, The goose eats the bone, lays an egg, and says, "Goodbye." Somehow a talking male goose that can lay golden eggs seems much more valuable than the * Golden egg * remaining, but we'll have to settle for what we can get. Examining the staff suggests it can be tapped against the ground to produce a retributive strike. But TAP STAFF -- Against the what? -- GROUND does nothing to dispel the leprechauns, despite the three-gold-snakes-and-no-potatoes motif of the staff's design. Does it work against the stone door? Nope. What about this stone called "Staffbreaker"? We can drop the staff near the stone door, and THROW STONE to produce a "RETRIBUTIVE STRIKE!" flashing message, after which we see a disintegrated door and some loose * Gold dust * we can't yet pick up. The now-accessible last treasure room contains a * Silver worm statue * and a * Rod of pure ruby *. What about the wine? Can we get the leprechauns drunk? Doesn't seem so. What's in the bag? We can't EXAMINE BAG (you see nothing special) or OPEN BAG (you don't have a key.) But we can EMPTY BAG to obtain some * Platinum Pieces *, then use the bag to collect the * Gold Dust * as we FILL BAG. We have six treasures now, and most of the puzzles seem to be solved. But we've found no way to obtain the pot of gold? Can we blast it into dust instead of the staff? Nope, using the staff here just deforms the ruby. If we throw the stone at the staff here, it blows up but we just have * Gold dust * and the unharmed * Pot of gold * (and leprechauns) after the explosion, and the stone door remains unbreachable. Even looking at the source code, I could find no way to dispel the Irish little people and claim their treasure. The SCORE mechanism is also not quite right -- I think it's meant to award a score of 12.5 multiplied by the number of treasures, but in fact it awards a value based on the number of treasures divided by 12.5, which is why we're not getting anywhere close to 100 percent. So I wasn't actually able to finish this one! Normally that means I don't publish anything here, preferring to give it another go later on, but since we have access to the source code I think I can say that we've seen most of what there is to see and do here. I expect the prolific Roger M. Wilcox will provide a correction in the near future, as the complexity of this one lends itself to more bugs than the norm for this series. I'll publish an update if I'm able to conclude the adventure! 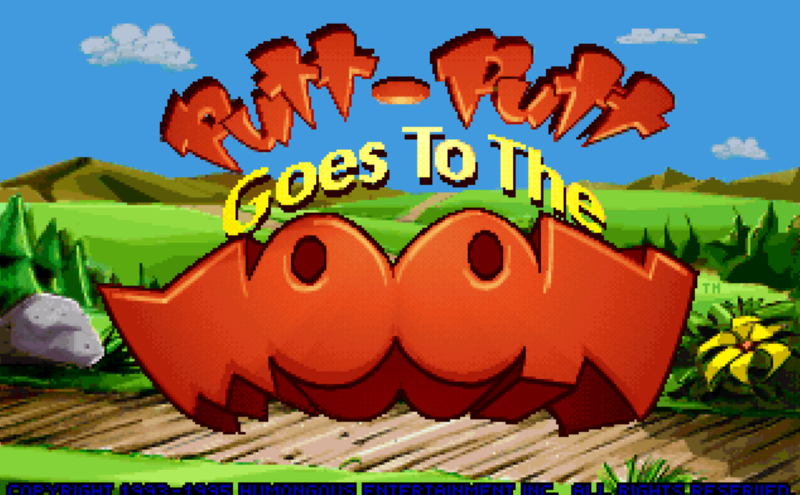 This week, we're joining the anthropomorphic automobile Putt-Putt and his peppy dog Pup puppy dog Pep for the second adventure in Humongous Entertainment's popular series, as Putt-Putt Goes to the Moon. Created by Ron Gilbert during his post-Monkey Island years, these games use the SCUMM engine under license and are aimed at children ages 3 to 8. The target audience makes for simple gameplay, but these are still entertaining little adventures with a charming sense of humor. The opening features a musical theme song with vocals, brief but rather innovative at the time. The story begins with Putt-Putt being invited down to the Cartown Fireworks Factory -- and since we've already seen the title, we may presume Mr. Firebird's rockets are rather more powerful than the usual. Pep is stowed in Putt-Putt's inventory, and the road leads straight to the factory, so we won't be shooing any cows out of the way this time. Again, there's a ton of fun incidental animation -- kids love to click on things, and every smokestack on the factory does something amusing. Humongous' artists put a lot of effort into these completely optional, repeating animations, and I'm sure a lot of very young children spent time poking around without ever trying to move the plot along. Mr. Firebird warns us not to touch the lever with the big "Do Not Touch" sign next to it, but he doesn't know how adventure gamers think, obviously. We can fiddle about making rockets with Mr. Firebird's help, but we really want to touch the prominent red lever... except Putt-Putt is a good little car, and just says, "I'd better not touch that." Dang it. Fortunately, in these games there's always a way to get something to happen without seeming responsible for it, and so it turns out that we can open a window, allowing a butterfly to enter, perch on the ladder, and attract Pep's innocent, enthusiastic attention. Soon, Pep has pulled the lever and Mr. Firebird is urging Putt-Putt to hang on because he's "going for a ride" (safety last!) In short order, Putt-Putt and his dog find themselves in space, as Pep dons a dog-sized astronaut helmet he found stashed somewhere. 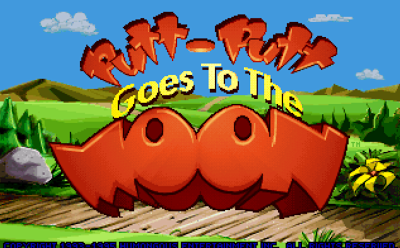 Putt-Putt is in orbit for a while, and can learn about how far away various planets are from a passing alien tourist booth, but the only reachable destination (as we might have suspected) is the moon, so Putt-Putt goes in for a landing, then starts wondering how he's going to get home. A spacefaring family of mice, just in from Kansas, suggest that Putt-Putt try launching himself off a flattish rock, but even the moon's weak gravity makes for some challenging escape velocity requirements. Pep runs into a dark cave -- apparently he enjoys these kinds of places, based on our initial meeting in Putt-Putt Joins the Parade -- leading to a game of hide-and-seek in an overhead maze. 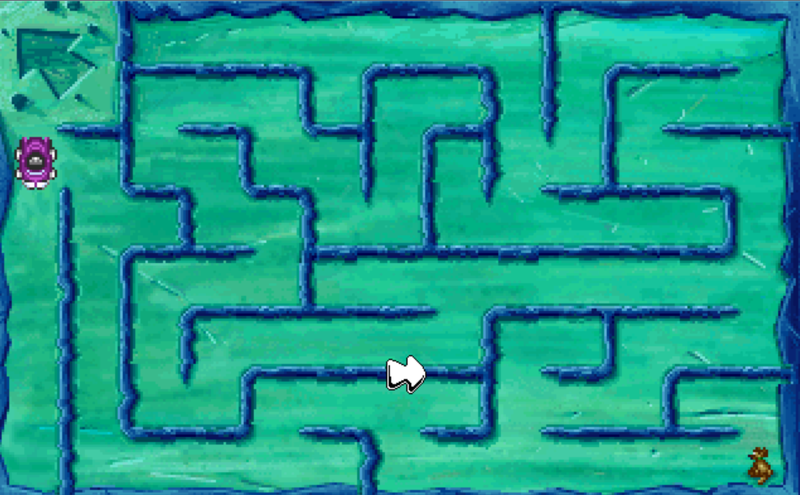 This activity is optional -- we can just call Pep back by clicking on the exit arrow in the upper left-hand corner, and while I thought we might need to search the maze for something useful, that never happens. Responsibility is not one of the things the Putt-Putt games attempt to teach -- we can read the Caution sign at a bridge, but then roll merrily over it until it breaks under Putt-Putt's weight and he falls into a green, mucky river. He's trapped, but blowing his horn summons Rover, a lunar rover left behind by astronauts from Earth -- he desperately wants to go home too, and gives Putt-Putt a photograph of the moon as a gift in exchange for his promised assistance. The moon seems to be rather more heavily populated than conventional wisdom would have one believe. The alien proprietors of Rocket Ice Cream are willing to sell their establishment, a genuine rocket, for ten glowing moon crystals. We'll also need to track down some parts -- a steering wheel, nose cone, rocket fuel, and key -- to get it into working order. So this will be a treasure hunt game, in essence. At the Cosmic Dust Diner, we can play a free round of Bear Stormin', a simple arcade game in which a bear in a biplane dodges balloons, pigs and other obstacles, fun but not required. Moon City Gas has rocket fuel available, but it seems we will need a container or something as the rocket is a good distance away. We can visit Moon City Hall, where Governor Moonbeam offers a key for a good deed. Fortunately there's a little red alien to rescue from the moon goo under the bridge, so that's one part down. We have to pick one key of several, but if we've forgotten what the rocket blueprint suggested, we can always trade an incorrect key for the right one later. Some aliens are playing basketball with what appears to be a nose cone as the basket, and we can join in the fun, for fun's sake. A beauty shop has a machine that performs radical makeovers on the customers -- Putt-Putt can play with this, mixing and matching a variety of cartoon alien heads, torsos and legs to comic effect. An apartment building features numbered/lettered rooms, populated with creatures doing comical things, again for our amusement. Putt-Putt can play alien tag -- kind of like whack-a-mole -- and this activity is not optional, as winning earns moon crystals, up to five at a time depending on how well we do at tagging the aliens as they pop up out of craters. We can play repeatedly, so it's not hard to earn the ten crystals needed to buy the rocket here. In the meanwhile, Rover has found the steering wheel, high up on a ledge where he can't reach it. He can boost Putt-Putt up, but Putt-Putt's extending arm can't reach it either. We need to use Pep to drag it closer and claim the last part needed. Rover goes to pack his things, and now we just need to figure out how to get some rocket fuel. 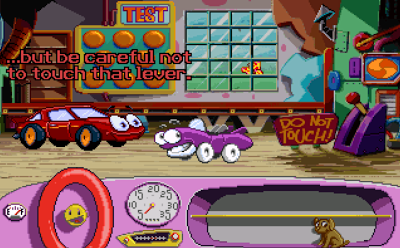 The Putt-Putt games used CD-ROM technology to support colorful cartoon artwork, especially impressive given the limitations of 256-color 320x200 VGA. We can observe various constellations using the moon's observatory telescope, and also learn about the planets of the solar system via an animated/narrated wall display. This educational content is unfortunately wholly optional; it would be nice if we had to know some of this to finish the game, but that might have shut out the youngest members of its target audience. 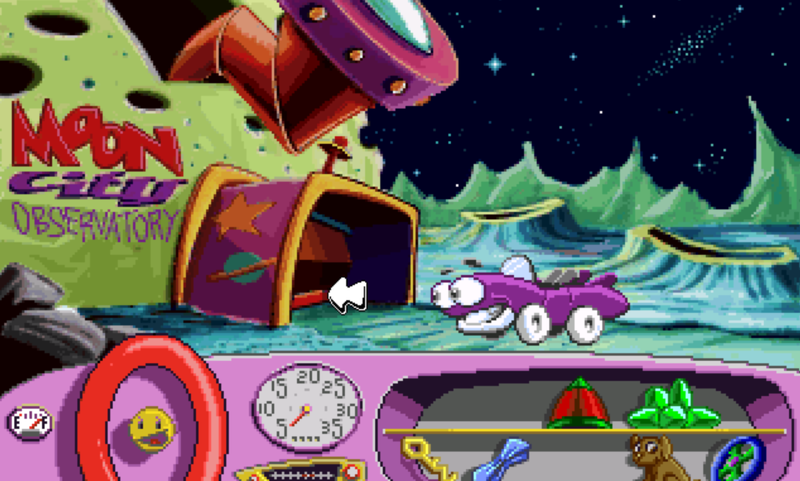 Putt-Putt buys the rocket ship, and the only item we still need is the rocket fuel. Putt-Putt is aware he can get it at the gas station, but how do we actually dispense it? Ah -- clicking on the station's door produces a note from proprietor Robby Radar, who's offsite at Apartment 3A; apparently he can't be bothered to run his own business. Nor can he stay in one place -- the girl in 3A tells us he's now at 1C (this all seems to be an exercise reinforcing alphabet/number learning, and encouraging youngsters to prepare for an Excel-based future.) The gentleman at 1C says Robby has now gone to 4C, where we finally track him down, and he agrees to give Putt-Putt some free rocket fuel (with a can, fortunately) back at the gas station. There's no explanation given for the freebie; perhaps it is some sort of persistence bonus. 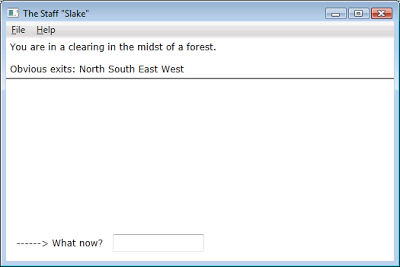 After a few posts spent in point-and-click territory, this week we're returning to the Roger M. Wilcox text adventure archives. 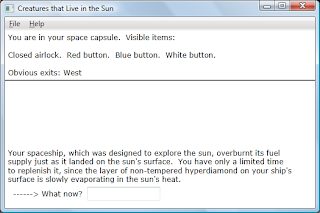 Creatures that Live in The Sun was Wilcox's eleventh game, originally written for the TRS-80 in 1981 and converted to Windows in 2013. Mr. Wilcox's games remain freely available at his website, and they're well worth checking out, especially for adventure fans that may have missed these back in the day. I'm sure a few readers have noticed the similarity of this game series' author's name to Space Quest protagonist, Roger Wilco. Any resemblance appears to be purely coincidental, but one can't help noting that many of Wilcox's games feature science fiction motifs, and this one is a time-constrained escape adventure, in which the player's ship has run out of fuel just after landing on the sun's... surface? (The author notes that this game was based on a creative writing project he wrote in the fifth grade, so we'll dispense with any scientific nitpicking.) Let's hope we can find enough fuel to achieve escape velocity! At the start, we are aboard our grounded ship, with a closed airlock and a console populated with patriotic buttons (not, like, Whip Inflation Now, but red, white and blue.) An engine room west of the starting point features a Better-than-asbestos suit -- presumably this means it is both heat-inhibiting and non-carcinogenic -- an empty fuel line, an empty bucket, and Strange dark goggles, suggesting that we may have missed some important equipment training in solonaut school. We've got nothing in inventory, so let's grab everything we can; the fuel line is fixed in place. We should also SAVE before we start messing with the buttons, if past experience is any guide. PUSH RED, and the airlock opens -- the sun's temperature melts the capsule from the inside out, and we're dead. If we PUSH BLUE instead, a transparent cover envelops the interior of the capsule -- a heat shield, perhaps? PUSH WHITE produces a warning light, "NO FUEL", so that will probably be one of our final actions at the end of the game. With the shield up, the sun doesn't damage the ship, but if we're not wearing the BTA suit, we're vaporized anyway. We may note in passing -- literally, while dying -- that It's too bright to see!, so that's probably why we have the dark goggles. With all the right stuff in place, we can see that B.T.A. sheets protect everything -- not quite as high-tech as I'd imagined, but I like that this new material is apparently named by the same people who produced Uneeda Biscuit and Better Made Potato Chips. We can exit through the airlock to reach the photosphere of Sol. 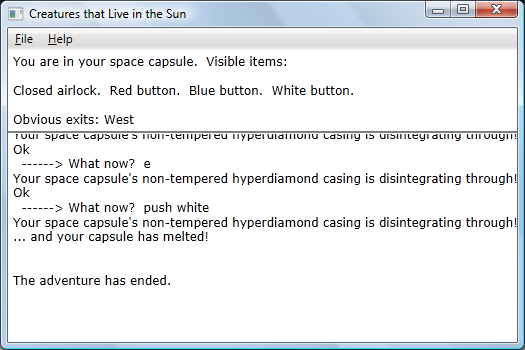 We can see that the capsule is slowly dissolving in the heat, so time is of the essence. We can also see a solar disturbance, likely wreaking all kinds of cable service havoc back on Earth. GO DISTURBANCE yields a Scott Adams-esque misleading prompt: Are you just going to walk through that solar flare? And while a thoughtful "No" click yields A wise decision, a reckless, foolhardy "Yes" click gets us through without apparent ill effect. This is an interesting idea -- we find ourselves on a river bank, but it's a river of salt (sodium chloride melts at 1474 degrees Fahrenheit, per a quick web search). We can FILL BUCKET to obtain a bucket of salt, and we can GO RIVER, though there doesn't seem to be a reason to do that yet. We can't FILL FUEL or FILL LINE with the bucket, though, so we must have to do some further work. We can POUR BUCKET -- on the surface, it just Soaks into the photosphere. Actually, it does this anywhere, even inside the ship with the airlock closed. 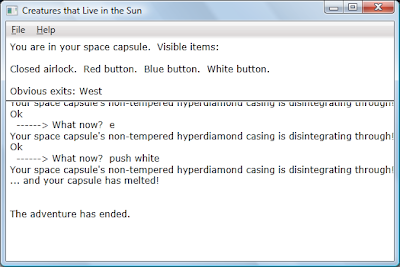 I spent some more time exploring the river and the bank, but before long, it seems, we're notified that Your space capsule's non-tempered hyperdiamond casing is disintegrating through! and we are in major trouble... unless we return to the ship and close the airlock, which buys us a little time... except, no, wait, it doesn't actually reset anything, and next time we open the airlock the meltdown continues, eventually melting the capsule and ending the game. What else can we do? EXAMINE SUIT reveals a yellow button on its left hand. PUSH YELLOW does nothing of note in the engine room, but if we try it in the river, A ray of cold shoots from your fingertips, doing nothing. It seems that it will fire, but do nothing, while the airlock is open, but if the airlock is closed it does nothing at all. I had to look at the code again to find out that we can FEEL RIVER -- I was trying to do something similar by DIVEing, but anyway -- to discover a Hyperdiamond "eye," marked Medusa H.D. Company. So this might be useful -- and yes, SHOW EYE turns the deadly gronk gronk into stone (Good work! The Medusa H.D. Company comes through again!) I assume H.D. stands for Hyperdiamond and not High Definition. Now we can reach the "solar junction," a crossroads where an Alien blueish-green man is standing (no word on whether this individual is littleish-small.) We can't TALK MAN, so we'll explore some more. A sunspot area features a locked sunspot case (?) that can't be opened at this point. Another solar flare is decidely not safe to walk through, of course. And there's a makeshift landing field, where the not-makeshift Solar Challenger (airplane) is parked. We can GO CHALLENGER to reach the cockpit, where we see green, black and orange buttons, most likely color-coded to prevent confusion on the part of the parser rather than the player, and having nothing to do with The Troubles and/or the Black Irish. We PUSH GREEN and the plane takes off; we can see a Gronk Gronk Fighter out the window, which based on previous experience we should probably try to dispatch. We PUSH ORANGE -- and A mechanical voice intones, "What is the password?" We don't have the password, so PUSH BLACK fires a cold ray, but the fighter evades it. Fortunately, we can PUSH GREEN to land again. We can LOOK MAN (or, oddly enough, FEEL MAN) to prompt conversation -- he asks us to defeat the Gronk Gronks' fighter (we suspected as much) and also obtain the key that opens the sunspot case. He then slips something into our hands -- it's a Gold Credit Card? There are no retail establishments on our map so far, but closer examination indicates that it's smudged, but we can read an "S."
Back on the Challenger (which was the name of a still-operating Space Shuttle when this game was originally written), we note that obvious guesses PASS and SOL don't work as passwords. We can WIPE CARD, though, to see "Srill" (briefly, before the card somehow smudges up again.) PUSH ORANGE and SAY SRILL activates the plane's SADAR tracking, allowing PUSH BLACK's cold ray to lock on and do the job properly. 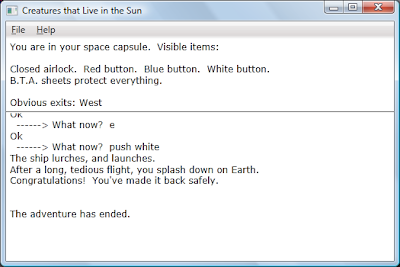 We're getting closer, but this was my second serious attempt, and I had taken too much time -- the capsule was once again melting, and we're too far away to do anything about it now. Back on track after restoring, we haven't found any reason to PUSH YELLOW or POUR BUCKET yet, so we should see if we can find opportunities to do so. POUR BUCKET in the solar flare area puts out the solar flare, opening up a passage south to an insignificant part of this granule. There's a large hyperdiamond here. We can PUSH YELLOW, and the ray shoots out, this time freezing the hyperdiamond extensively. I tried to HIT, KICK, PUSH, and SMASH the frozen diamond, but we just need to BREAK DIAMOND to form a hyperdiamond key. Upon seeing us again, the alien takes us to the sunspot (which was being used as a freezer) and opens the case, revealing a Container of solid fuel, which ought to be just the ticket home. Moving as quickly as we can, lest our ship dissolve again, we run all the way back to the ship, close the airlock, FILL LINE with the solid fuel, and PUSH WHITE to take off to... ACK! Not quite, I missed it by just one move it seems! Doing it ever-so-slightly more efficiently, we get the best ending, marred only by boring transportation! No treasures, just a fine story to share at the Space Bar after we cool down a bit. 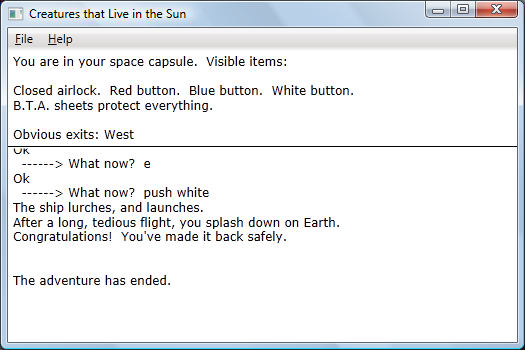 Creatures that Live in the Sun was good fun. More Roger Wilcox adventures await!